The first six months of 2015 were filled with tales of scandal and expansion for the national and San Diego defense communities. Budget woes aren’t out of the picture yet either, as the 2016 deadline for round two of sequestration looms closer. The big story of the year so far is the resignation of former Secretary of Defense Chuck Hagel and the swearing-in of his successor Ashton Carter in February. Carter, who previously served as deputy secretary of defense and undersecretary of defense for acquisition, technology and logistics, laid out three goals for his tenure: assist the president in making the best national security decisions; maintain a strong, healthy force; and use dwindling funds wisely. 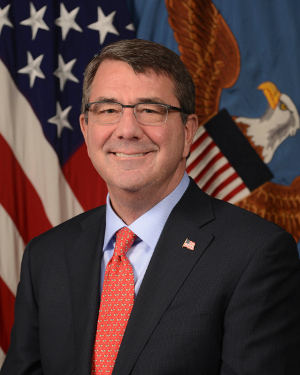 Ashton Carter was sworn in as Secretary of Defense on Feb. 17, 2015. Though he was arrested in a sting operation in San Diego back in 2013, “Fat” Leonard Francis’ trial began this year with a guilty plea, and has now entangled some three dozen U.S. Navy officers in its tentacles. In April, Lt. Cmdr. Todd Dale Malaki became the eighth person convicted of corruption in the case, which involved Navy commanders taking bribes in the form of money, prostitutes and travel expenses in exchange for ship schedule information and rerouting Navy vessels to ports owned or operated by Francis’ Glenn Defense Marine Asia contracting company. And that wasn’t the only scandal. In April, the Navy relieved Capt. John Banigan, commander of the USS Lake Erie, after an investigation showed poor command on the San Diego-based guided-missile cruiser, which followed the removal of the USS Cowpens’ CO last August, who ensconced himself in his cabin, leaving commanding duties to a lieutenant commander that he had unduly familiar relations with. 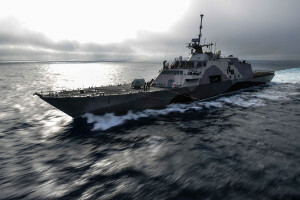 San Diego will be the homeport for 15 additional Littoral Combat Ships by 2020, and will serve as what’s being called “LCS Country,” with simulators, offices and training space for the LCS program housed at Naval Base San Diego. All LCS-related programs are expected to be moved to the renovated 316,827-square-foot former Defense Logistics Agency building — Building 3304 on the base's wet side. To accommodate this increase in traffic, BAE Systems made a $100 million investment to its ship repair yard, adding another dry dock and replacing an aging pier. Naval Base San Diego is expected to surpass Norfolk, Va. as the largest Navy base in the country — and probably world — in two years as it adds a total of 19 new vessels to its repertoire. Not to be outdone by the LCS program, the Navy SEALS have charged ahead with plans for a new base on Silver Strand in 2015. The $700 million, 24-project campus for the Special Warfare Command on the south end of Silver Strand Training Complex will accommodate a growing Navy SEAL force and aging facilities at its command on Coronado. For ongoing national and local coverage of the defense industry, visit sddt.com/defense.